Travel to a remote campsite near Igatpuri and spend a night camping by the lakeside. At the campsite, you can participate in fun activities like paddle boating, kayaking and swimming in the lake. As the evening draws closer, you can relax in your tents with gorgeous sunset views. As the stars begin twinkling, you'll gather around a bonfire and enjoy the night with your friends. After dinner, you can join your fellow campers for a short, 1-hr night trek around the campsite, before retiring in your tents for the night. Igatpuri is a small hill station in the mountains of the Western Ghats. Your campsite, located on the banks of a lake, is accessible via a 1-hr drive from Igatpuri. The tents will be pitched in a single row on a narrow, raised ridge overlooking the lake. With the hills of the Sahyadri range standing tall on the other side of the lake, the campsite is a great place to catch the evening sunset. You may want to bring an extra blanket as the nights can get quite chilly. • Participate in fun activities like paddle boating and kayaking. • Explore the surroundings with an easy, 1-hr night trek. • Have fun with your friends around the bonfire. • Sleep in tents pitched with views of the lake. A basic level of health and fitness is required to book this Igatpuri camping trip. If you have asthma, heart conditions, and spine or knee problems, please consult your personal physician before booking this trip. Travellers are required to follow instructions of the camp leader during the Igatpuri camping trip. For cancellations made 8 days or more before check-in date of the Igatpuri camping trip: 75% refund. For cancellations made 4-7 days before check-in date of the Igatpuri camping trip: 50% refund. For cancellations made less than 4 days before check-in date of the Igatpuri camping trip: no refund. Check-in time at the campsite is 14:00 hrs while check-out time at the campsite is 11:00 hrs. Transport from Kasara railway station can be arranged in a shared, private vehicle at an additional cost of INR 400 per person. Non-vegetarian meals can be arranged at an additional cost of INR 150 per person. You're required to wear a life jacket while participating in any water activities like boating, kayaking or swimming. There is no pick-up for this Igatpuri camping trip. There is no drop-off for this Igatpuri camping trip. Day 1 of camping near Igatpuri: Check-in and enjoy! Arrive at the campsite by 14:00 hrs. You can drop you bags in your tents and head out to participate in a few water activities like boating, kayaking and swimming on the lake. As the evening draws closer, you'll have some snacks with tea and watch sunset views from your tents. As the sky turns dark and stars begin twinkling, you'll gather around a bonfire and enjoy the night with your friends. After dinner, you can join your fellow campers for a short, 1-hr night trek around the campsite. Return back to the campsite and retire back to your tents. Overnight in tents at Igatpuri campsite. Lakeside views from the campsite. Spend the morning at leisure. Post breakfast, you'll check-out of the campsite by 11:00 hrs. Your trip ends here. Morning views over the sun. Overnight in tents at Igatpuri campsite. Check-in time at the campsite is 14:00 hrs. You'll be accommodated in tents at the campsite. You may want to bring an extra blanket since it can get quite cold at night. Today's meal package includes evening snacks and dinner. Evening snacks usually include potato vada, bhel and tea. All meals will be vegetarian. Today's meal package includes breakfast only. Breakfast usually includes poha and tea. Check-out time at the campsite is 11:00 hrs. 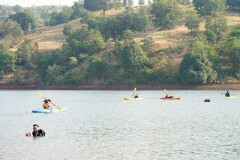 The campsite, accessible via road, is located 70-km/2-hr drive from Nashik and 125-km/3-hr drive from Mumbai. For travellers from Mumbai, transport from Kasara can be arranged at an extra cost.